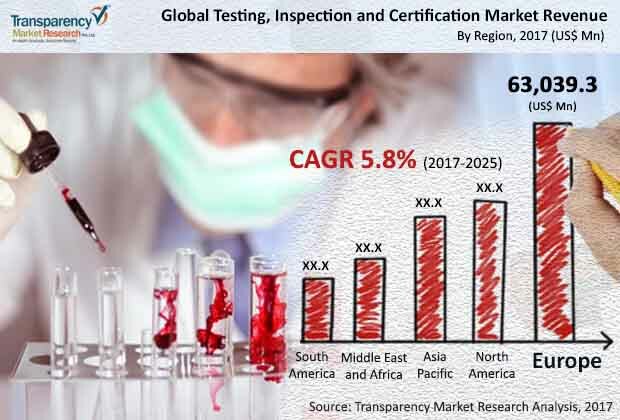 The global testing, inspection and certification (TIC) market is characterized by increasing degree of fragmentation in the vendor landscape over the past several years, finds Transparency Market Research (TMR). The presence of a large number of players vying for sizeable stakes in the market makes it increasingly competitive, as well. Several top players are engaging in strategic mergers and acquisitions to strengthen their positions in the global testing, inspection and certification (TIC) market. TMR notes that a growing number of key players are seeking emerging markets to consolidate their shares in the next few years. The global testing, inspection and certification market stood is expected to garner a CAGR of 5.8% during 2017–2025. The market stood at US$184,545.5 million in 2016 and is anticipated to reach worth of US$299,628.6 million by the end of 2025. Among the various types of services, testing and inspection holds a whopping share of 95.0% in the global TIC market in 2016. The rising uptake is fueled by recurrent focus on hygiene in food and supply environments across the globe. The segment is expected to retain its lead in the next few years as well. Regionally, Europe held the leading share in the global testing, inspection and certification market and is expected to maintain its status quo over the assessment period. The prominence is attributed to the stringent implementation of safety regulations in the industries such as food and beverages, chemical, water and wastewater, and transportation and logistics. Growing number of industry players who are committed to quality and increasing focus on end-to-end approach to inspection in operations are key factors driving the demand for testing, inspection, and certification services. The growing role of testing, inspection, and certification in a wide range of industries as to ensure a better standard in production and operations is a notable trend boosting the market. Moreover, the global market is witnessing a large impetus owing to changing compliance regulations for enterprises in various industries such as pharmaceuticals, chemicals, energy, food and beverages, semiconductors, and consumer goods. Changing product regulatory framework in developed nations has been imparting a substantial momentum to the global testing, inspection, and certification market. A great deal of impetus will come from the stringent implementation of regulations in the automotive industries and food and services industries. The adoption of lane departure systems and intelligent vehicle response technologies in developed nations of Europe and North America is a case in point. The global testing, inspection, and certification market is expected to witness new horizon of opportunities in the rising trend of outsourcing the services, especially in emerging economies such as South America and Asia Pacific. Adherence to food safety regulations in recent years in several economies of Asia Pacific has imparted a robust fillip to the uptake of testing, inspection, and certification services.